On Jan 12, 2018, Tom Decker and Jamie Johnson enjoyed a lively conversation in Chicago Green Insulation’s warehouse, surrounded by barrels of foam insulation. Tom has grown a successful enterprise that focuses on hiring underserved individuals in Chicago, such as the low income and those with a previous history of incarceration. Tom talks about how he believes in second chances, as well as how that has worked in his company's success. Did you know we have a free energy efficiency checklist your business can utilize? Click below to download! Jamie: Welcome back to Episode 5 of the Verde Podcast. 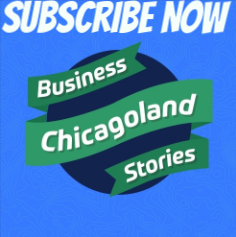 Every week we talk to local business leaders and entrepreneurs to understand the real story that doesn't make it to the spotlight, but is how actual businesses are actually built here in Chicago. 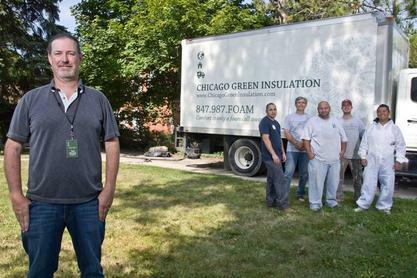 Today we have Tom Decker, who's the founder of Chicago Green Insulation. Welcome, Tom. Tom Decker: Thank you very much, Jamie. I appreciate you having me. Jamie: Tom and I have known each other for many, many years, and have followed each other along the entrepreneurial journey. I think we're both still kicking, so that's good, right? Tom Decker: That's it. There's something to be said for making it beyond the two year mark, and then the three year mark. I'm at almost a decade in foam. Tom Decker: What are you at this point? Jamie: Verde's about eight years old right now. Tom Decker: So that's why it's such a similar path in terms of timing. I think I'm closer to nine than I am to ten, totally. Jamie: Each year has its own wrinkle and ulcer that we've both inherited along the way. Tom Decker: I keep a smile on my face because it's fun. I also keep a smile on my face, when it's not fun; because people don't want to be around frowning, angry, miserable people, but entrepreneurship is the right pathway for me. Jamie: I get that sense from the first time I met you that you were a trailblazer. So tell me a little bit about Chicago Green Insulation. Why you started it, what gave you the idea, and what motivated you to take it from an idea to an actual business? Tom Decker: As I said, I've been in foam for somewhere between nine and ten years. When I got into foam, I was a sales guy. I learned the nuances, ins and outs, and all the technical stuff. I did that for two other organizations for about four and a half years. What was awesome about that is I really got the opportunity to help create, and participate in creating, alter energy efficient single family homes, multi-family homes, businesses. I got to learn a lot about the chemical manufacturers. I got to learn a lot about the equipment manufacturers. I got to know the movers and shakers, the peers, the individuals that when I grow up I want to be like. And about five years ago, I sat up in bed one night and realized that I had neglected to participate in embracing the first 25 years of my professional life, which is something you and I've certainly talked about, but involving individuals with learning disabilities, involving individuals who have been rejected, either directly by society or who have chosen to be away from the rest of society because of learning differences and social differences and those sorts of things. So when I formed Chicago Green Insulation, I formed it from its outset to be a social enterprise to create employment opportunities embracing those individuals who've run afoul of the law, embracing those individuals who may not verbally or physically represent themselves as somebody that you want to be next to, but have a good heart and a good head on their shoulders. Tom Decker: I was frustrated with the compromises that I was forced to make when I wasn't the guy signing the paychecks. You know as well as I do that there's a lot of stress that comes along with signing the paychecks; but you really get to decide where the can of corn goes in the kitchen, which drawer's going to have the silverware in it, and where the stove's going to be oriented in the kitchen. That's what entrepreneurship offers you, the access to being with that total freedom and total responsibility. My wife regularly comments that it must be nice not to have a boss, and I respond, "I wouldn't know." And she's like, "Well, you own the company." And I'm like, "Yeah, and every client's my boss. Every employee's my boss." Tom Decker: So I don't see myself as above them, and I also don't want to ever neglect the value that I can learn and offer across the board. Jamie: Yeah, it's funny, I had a little bit of a different motivation. But I remember after I started the company, and we didn't really do much for a year or two. We were doing some software things, which you remember. I remember Chuck Templeton talking about how entrepreneurs are often really terrible employees. I look back at all the different careers I had, and I'm pretty sure my bosses always hated me. You know, like I was a good employee in some ways, but not in the ways I was always bucking the system and creating problems. So it kind of felt good, once I could settle into that role of, "Okay. I'm an entrepreneur; that's who, apparently I've been my whole life. I wasn't just a bad employee. I just was kind of weird in my own way." Tom Decker: Square peg in a round hole? Tom Decker: The residential camp where I worked for 15 years, Ramapo Anchorage Camp in Rhinebeck, New York. My mentor and the executive director of the camp, Bernie Kosberg, and I had a number of conversations about how residential programs, where you're dealing with non-textbook situations and the answers are incumbent on a creative, thoughtful process that does not, generally speaking, lend itself to a correct answer on the first, second, third, or even fourth or fifth try. When you experience those sorts of things, and you understand that your reality is in your hands, I always said the Ramapo made great problem-solvers and lousy employees because we're quick to identify what those challenges are, and the way that I very much believe, it forces us to be responsible for the solution as well. That was Bernie's rule. If you identify a problem, you own the solution. He was incredibly serious about soup to nuts. You've got to go out and figure out why it's happening, what's going on, what are the reasons that that was the way it was being done, and then why we need to go to option a, b, c, or d; and then, what you were going to do to make a, b, c, and d happen. Jamie: Right, that kind of thinking doesn't always fit into today's corporate culture or where I came from, which is municipal government; because usually, you could even come up with a solution, they're not going to let you do it anyways. Tom Decker: Well, and that's the conversation that I'm currently engaging with, with your old colleague, Tim. Tom Decker: Talking about how you were incredibly adept at the adrenaline aspects of responding in a very kind and very competent and very professional way. And, that the organization was lesser as a result of you not being around though he knew in you that you were bigger than the whole that you were fitting into. So he knew you were headed on to bigger and better things a long time ago, he said. Jamie: Yeah. He continues to say nice things, even though he shouldn't, about me. What are some of your favorite parts about running your business? What is unique about your company? What is unique about your style? You already talked a little bit about the special attention you give to unique individuals and working them into your business model. So, what are your favorite parts? Tom Decker: I love the hiring process that we've created. I feel like it's unique. We offer paid interviews. So you make $13 an hour for eight hours, and the actual interview process is not a resume and sitting across a desk from myself or one of my supervisors. It's actually a phone screen that covers the core competencies of what we're looking for then, based upon the results of that phone screen, you're invited out for an eight hour working interview. That eight hours is paid. If you make it through the first day, you'll get invited to a second, a third, a fourth, and a fifth day. The actual decision on whether or not you're extended an offer of full-time employment is the crew, even if the most junior guy on that crew, the Friday before you came in on Monday, was his first day. The look in people's eyes when I explain that the hiring is done by the crew, they're amazed. Then you get that buy-in when it comes to their production and their teamwork, because there is no "i" in team. Your most experienced, your most senior individual, and your weakest link, you're only as good as that weakest link. Tom Decker: Well, that's where it came from. I had half a dozen different men, who I thought were just going to be rock stars, that didn't make it to 10 a.m. on their first day. I mean three hours! Come on. This model really takes that off, and takes the pressure off. You have a gap in your resume doesn't mean that you're a failure and miserable. You have come through drug and alcohol treatment, or other sorts of challenges, doesn't mean that you're judged based upon that. We certainly work to maintain a clean, drug-free environment, and everybody's subject to all the drug testing and all that, but your shortcomings and failures don't have to define you. We talk a lot about how the next several chapters of your life are going to be awesome because we're going to collaborate together to deliver the finest spray foam insulation in the finest way. The other piece that's unique is at the end of the job my guys pull out a stencil, and they spray paint onto the foam, and they sign their names the same way the individuals that created the Stradivarius violins signed their names to the inside of those violins, because I want them to have pride in something that no one in our lifetime may ever see again. Jamie: Yeah, that's true. That's really cool. It's nice to see you inspiring pride in work, because it's not something that always happens today. Tom Decker: Our mission at Chicago Green Insulation is by the year 2027 we want the city of Chicago to be the safest and most energy efficient city in the world, and I cannot get there by myself. I am only going to get there as a result of the community that I'm fortunate enough to be a member of and the changes that are going on; because the bloodshed that occurs on the streets of the city of Chicago today does not have to be what happens tomorrow. If every small business out there had one or two more awesome participants on their team, and those individuals instead of standing on a street corner could be at home in bed with money in the bank and a home that they owned, they wake up the next morning, put the kids on the bus, go off to work, and nobody dies. Jamie: Yeah. We got quite a mess here in the city, and there's not enough people trying to fix it, that's for sure. Tom Decker: Well, I think there's plenty of people trying to fix it. I think that the ideas that are on the table are limited. One of my clients, his daughter worked for the MacArthur Foundation, and they did a side-by-side study where they dedicated several million dollars to mentoring, and after school programs, and all kinds of resources for one community and then nothing for the next community; and tracked what the outcomes were for various at risk individuals and found only a marginal advantage to the side that they put the money in. When they went back and dissected what happened and why it happened, it came back and said it's not about any of those things. Those things are awesome. It's about jobs. Tom Decker: You got to have a job, and not just a job standing at a counter, which may, in fact, be what you want. Okay, then you need a job standing at a counter. But something where you can not only contribute in a high quality way, but feel good about yourself. Jamie: I don't remember the stats, but the unemployment of African-American men in Chicago that are in their 20s and 30s is ... I remember it was staggering, whatever it was. Close to 50% I believe. And, that's inspiring to hear business owners, or a business owner, thinking that part of the solution is providing good quality jobs, which is obvious; and yet, I don't hear people talking about it very often. Tom Decker: WBEZ did a study with the University of Chicago, and I'm going to be a little vague on the numbers because I don't have it in front of me, but it was something in the neighborhood of 6,000 young men between the ages of 16 and 28 caused 90% of the violence on the streets of Chicago. Now, I'm not talking about employing those 6,000, I'm talking about employing those other individuals, so that those 6,000 start to see that there's an option. Tom Decker: So, I don't offer jobs to the ones that don't want it, I offer it to the ones that want out. Jamie: And then give them an opportunity, right? Yeah, that's cool. Segue a bit, just to move on to keep it focused on ... You and I have a passion for social enterprise, which we could talk about all day long, and we have. What is the most challenging time you recall in running your business? You know, the last years that you've been doing this, what stands out as the single most challenging time? Tom Decker: How to get somebody to do something as well, or better than, you would. I mean, I'm pretty humble when it comes down to it. I've been lucky. I've got a good work ethic. I know a great community of people. I've certainly participated in creating those things, but finding salespeople that have that same level of enthusiasm and want to go out there and understand it. That's the conversation we were having just before the podcast started. How to identify somebody who is going to have the technical savvy, as well as, the get up and go. Jamie: It's a big challenge, for sure. Jamie: And we talked about where you find those people and how you motivate them properly; and there's great sales people out there, but they're making six figures for some big company, and it's hard for us to pay that, for a small business to pay something like that. Tom Decker: And then on the install side, I use the story of my buddy in North Dakota, who simply has the spray foam insulation done like the one I'm about to hand you here. His job for the last 25 years has been spraying foam insulation using a gun just like that one you're holding. He earns $100,000 a year. He works four days a week. He works four 12-hour days. He gets four months a year off. He gets a car, health insurance, retirement, all paid for with no contribution required from him., and all he does is pull the trigger. So I don't have jobs like that that I can offer, but when I start talking about somebody coming into this, there's 500,000 jobs nationwide being created to install foam over the next five years. Jamie: That's crazy. I read a book recently. I'll try to put a link up to it, but it talks about the growth of the business. In that, really, a lot of the business will ride the strengths of the owner up until a certain point. I don't remember if that was a million dollars of revenue annually, or if it was twenty employees or what the metric was. But I've known you for a long time, your strength is sales. You can sell anything, and that's the best quality of an entrepreneur, I think, in my experience, is to be able to communicate the vision and drive the sales because that's what drives the business. Once you go to a certain point, though, this book talked about how then you have to rely on the owner stepping out of their strength, and that's the even harder part, to accelerate. Tom Decker: Right, and the owner stepping out of their strength or pairing themselves with others who have the strengths that you don't have to allow you to continue to pursue that strength and mentor others into that strength. Tom Decker: And that's the transition that I'm currently in the process of working on. Jamie: You kind of hire for your weakness in the beginning, and then after that, you hire to complement your strengths. They're both hard, neither one is easy. Hiring people is not easy, and growing a company is not easy. Tom Decker: If you go online and look at the Google reviews of Tom Decker, Chicago Green Insulation, you see all of these different people who have had me in their house. What I'm looking for is to get somebody that reports to me to have those reviews about them with the quality of the work done on the backside. Jamie: It's a challenge. I look forward to sitting down with you in a year or two and hear about the few folks you hired that replace that. So tell me a little bit about your experience in making sustainability a priority in your business, and how does it effect ... We were talking a little bit about your Prius that you've had since the beginning of business. Just give me a quick read. I know you're entire core value you offer customers is a very simple product, but internally how do you think about sustainability? Tom Decker: I see sustainability and environmental stewardship, as well as economic opportunity, all tied together. We're standing here in my shop around the corner from the Tesla dealership. I don't drive or own a Tesla, not that I could afford one in fact, if I had the money in the bank. Not that I'd want one, if I had the money in the bank, or currently could afford one. I see this as a modern, every person opportunity, because the foam insulation at market rate does a great job for single family homes of any size. Where I get most excited is where we can do this in a way that Chicago Bungalow is owned for $80,000 to $100,000 with a near net zero utility bill, and that individual at $13-$15 an hour starting out, going up to $20-$25-$30 an hour, is working for me or you or somebody else, so they're creating generational wealth. So I see all of those things tied together, and I think we're at a unique crossroads with the Obama Presidential Center coming and all the economic opportunity that, that's going to create. Jamie: Well, Tom, as always, wonderful talking to you. Thanks for being on our episode, and look forward to talking to you again. Tom Decker: Thank you, Jamie. I appreciate it.